Our Agri-centerfeed paper is Ideal for use through out the farm / workshop. 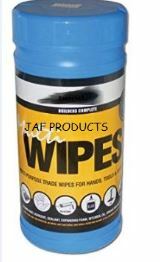 Anti-Bacterial disposable multi-purpose trade wipes for hands, tools and surfaces. Cleans paint, adhesive, sealant, expanding foam, bitumen, oil, grease, grime and much more! Comes in a handy re-sealable container. Ideal for the workshop, office, home or on the move. No need for water, soap and cleaners. No need to dirty towels. One wipe does the job! Tested by "The Institute For Skin Research" - no reaction (irritation) was recorded on the test subjects! Contains Vitamin E and Aloe Vera to minimise any irritation on skin. Why buy Bond-It Multi-purpose wipes? Quick, clean, easy and effective! 80 Large tough wipes (20 cm x 27 cm) that contain an anti-bacterial agent and highly effective against E-Coli, Salmonella, MRSA and Listeria. Fantastic for trades people that do not have access to cleaning facilities or do not want to dirty customers bathrooms etc... It saves the need for water, soap and towels. Supplied in a tough, handy dispensing tub. Caution: Keep out of the reach of children and away from heat and flames. In case of eye contact irrigate immediately with water. If symptoms persist seek medical attention. NOTE: Dry the fluid from hands before handling sensitive items or equipment.